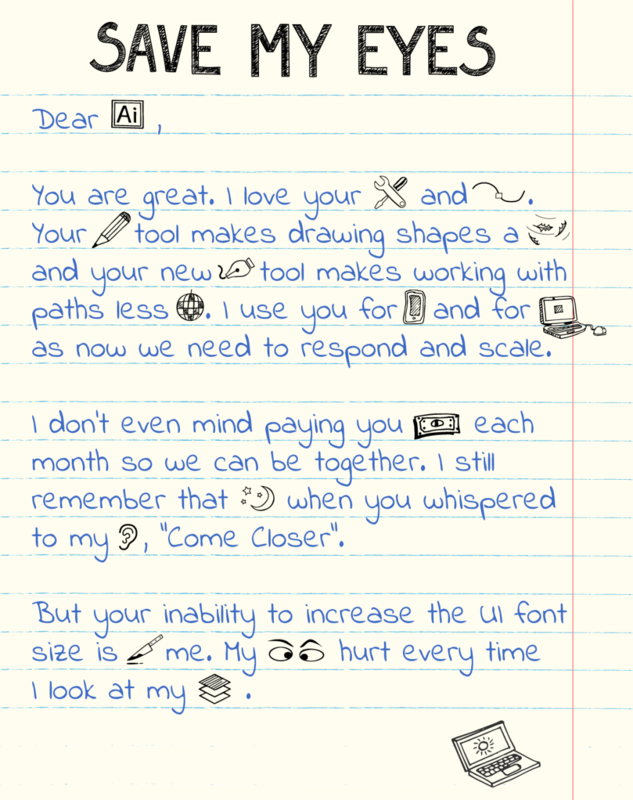 Do you love Adobe Illustrator but have problems staring at its tiny UI fonts? Help to change it by spreading this open letter. 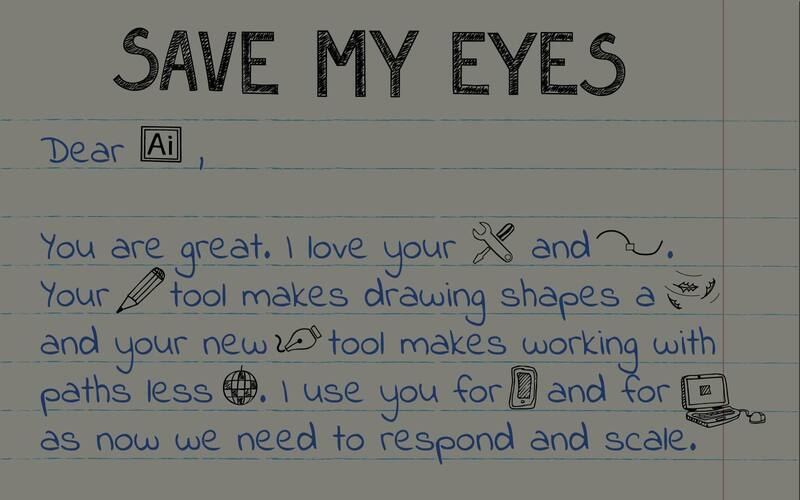 Let’s make Adobe Illustrator a better tool for all illustrators and designers. According to this reply, the ability to increase UI icons and font size was on the Adobe’s list already in October 2013. 1.5 years later this is still not implemented. We understand this might not be an easy change, but we think it should be at the top of the list in 2015. Help us to carry this through. 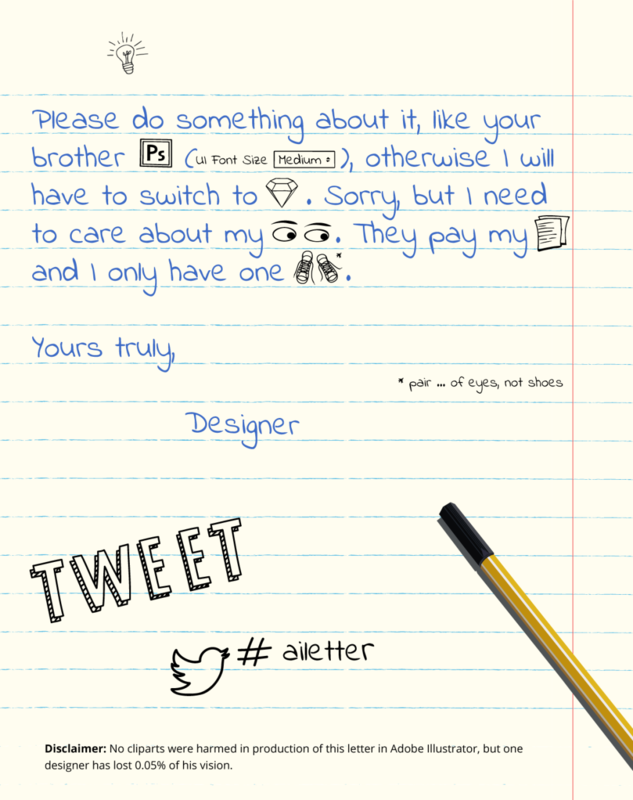 This open letter was designed using the following free vector art from Freepik.com – Back to school sketches in notebook, Business icons in doodle style and Social media drawing icons. We have implemented UI scaling since Ai 17.1. Are you on Windows or Mac? Our UI scaling is tied to OS scale. We have support for 100, 150 and 200% scaling of our UI on Windows. We already had support for retina screens on Mac. You can share more details at [email protected]. We will love to help out. thank you for your reply! I know about the UI scaling and appreciate that. However, my problem isn't about UI scaling as I'm at 24" display with native 1920x1200px resolution and don't want to scale Windows itself. What would really help is if there is an option for increasing the UI Font Size to Medium or Large like in Photoshop CC. It's just 1px difference, but at least for me it makes a huge difference to look at UI texts in PS set to Medium and default UI text size in other Adobe products. I understand this is not problem for everyone and could be specific to my setup but 7px is simply below my comfort level. This applies to all texts, whether those are tools labels, layer names, values, etc. If the Adobe Illustrator team can allow increasing the UI font size, I think it would be great accessibility and usability improvement, at least for those who perceive the default font size as too small for comfortable work. Thank God somebody else is seeing this same problem Ive been talking about for years. Please Adobe, both on Windows and Mac platforms, update all Adobe applications including Illustrator, Photoshop, Indesign, etc. to have full customization of the UI to increase font size, icons, etc. The monitor resolutions keep getting higher and higher but these programs are not being upgraded with that in terms of usability and accessibility. The font sizes keep getting smaller and smaller each time the resolution goes up. We desperately need changes to this applications so that we can control the font sizes of the user interface and the size of icons so we can see much better when working. This is ridiculous that you guys have known about this for years but dont do anything about it because its "not a high priority". How about putting this at the top of the list and putting other features that don't impact daily use of the program in every way lower on the totem pole. I have written in a bunch of times to Adobe feedback and haven't gotten any responses at all to this problem. Please respond. Thanks, Alex, I completely agree. Unfortunately, this change hasn't appeared in AI CC 2015 and even worse it came with some serious bugs like https://forums.adobe.com/thread/1881886 (which I'm personally affected by too and only solution was to downgrade to AI CC 2014). It seems that currently the AI team has troubles to deliver a functional product so I don't see it very optimistic with such 'unimportant' things like the tool's ergonomics. is this fixed yet!? I literally have to bring my laptop to my face to see the icons and words on AI!!! Please help if you know how!! I'm not old, but my eyes feel like it after using illustrator! It wasn't fixed. Smart guides point suggestion like "Intersection, center and etc." are small as hell and not affected by UI scaling.